Equip your sprint car with spindles from one of the top names in racing - Winters Performance Products. These anodized black aluminum spindles have 3-1/4” bolt spacing and steel straight snouts. 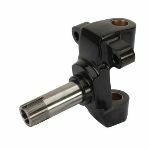 The innovative spindle nut design makes it impossible for the nut to work itself loose when racing. 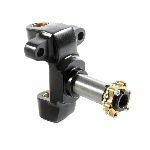 Fits sprint car axles that accept a 5.6" long kingpin, such as 940-35014 (steel) or 546-01440 (titanium).